The Pioneer SGY-PM900H79 power meter and SGX-CA900 cyclocomputer were developed with the Belkin ProTeam and feature completely independent left-right pedaling analysis. 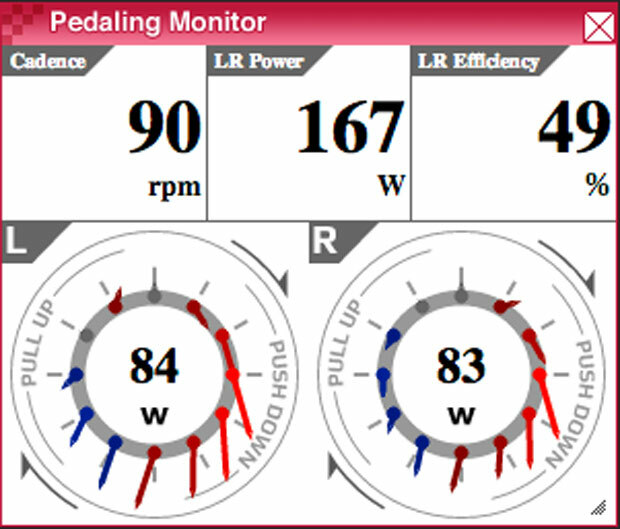 We review both and explore the new possibilities for improving your pedaling at the same time as tracking your power. Let’s get the obvious question out of the way first. Is this system from the electronics giant, or is there going to be another “Café Roubaix” polemic brewing? No fear, it is indeed the audio and video company behind the SGY-PM900H79. But what's an AV company doing in the bicycle industry? What background do they have, and is it just a slap-dash job to parachute into a new business market? 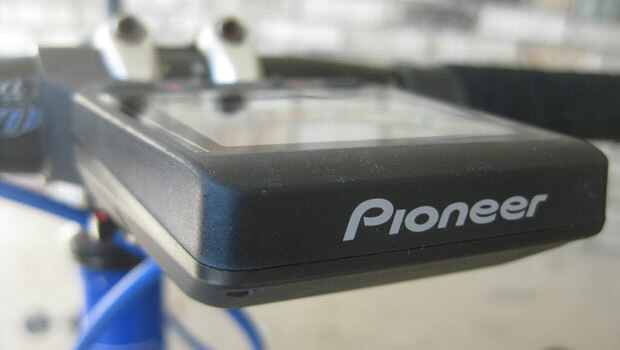 The Pioneer is quite unlike other power meters based around the cranks or bottom bracket. As is the case with many startup companies in the cycling industry, the Pioneer system came about from the commitment and passion of a few people. In this case, it was a group of engineers at Pioneer in Japan who were also keen cyclists, and who wanted to build something novel and unique themselves. This happened to mesh with Pioneer’s desire to explore new markets, so the green light was given. 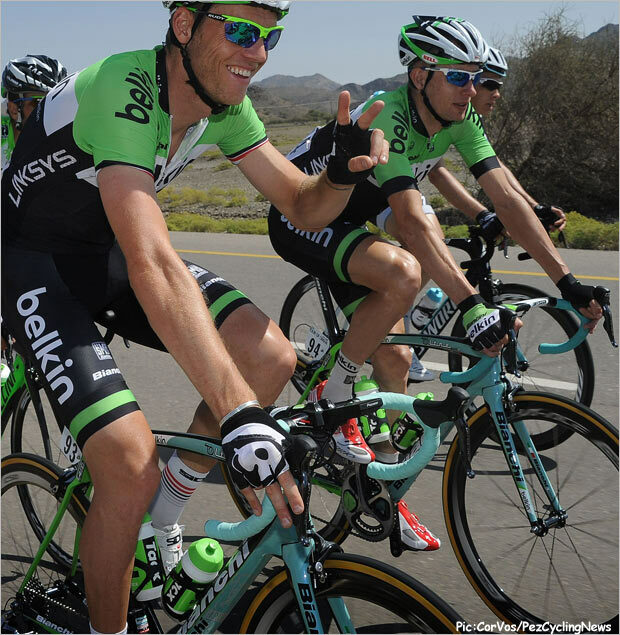 Team Belkin has been using the Pioneer system for several months. The good news is that Pioneer isn’t just throwing a product together and hoping that its name recognition will ensure market share, as has been the case too often with the computer and other technology industries. At the heart of a power monitoring system is the need to process and transmit quality data, and that expertise was already in-house from Pioneer’s long background in audio and video systems. We’ll see the importance of that shortly. 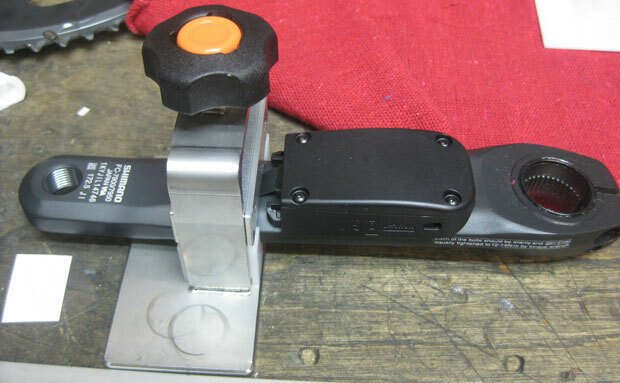 Separate strain gauges, each with its own transmitter, are installed onto the left and right crankarms. This is the setup for the right crank on its custom installation jig, with the gauges upper left and the ANT+ transmitter bottom right. 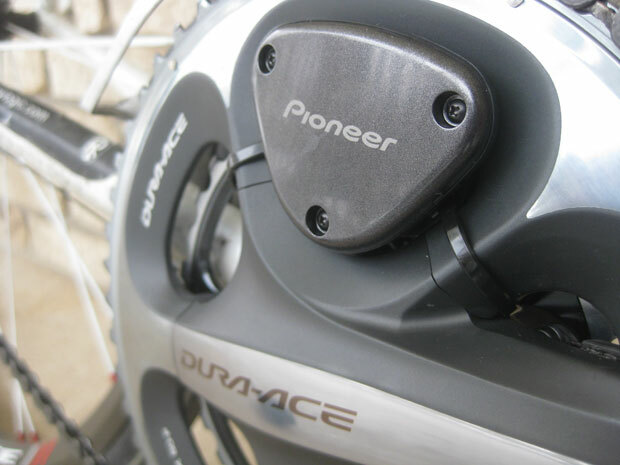 The novel aspect of Pioneer’s approach is that it is truly independent power in each crank that is being sensed and measured. This is achieved by having a separate set of strain gauges and transmitters on each crankarm. 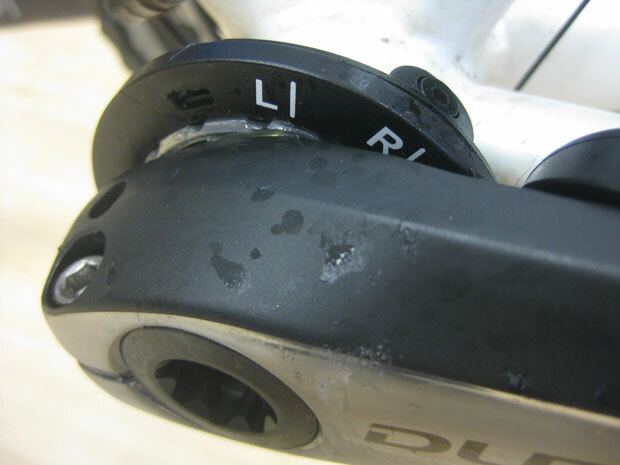 This is unlike other crank/bottom bracket systems, which may claim the ability to measure left-right pedal force or dynamics, but do so through a series of assumptions that may or may not be valid. This makes the Pioneer more appropriately classed with the newer pedal-based power monitors, where independence is achieved with separate strain gauges in each pedal. The total weight of the two sets of strain gauges, transmitters, and bottom bracket magnets is minimal at 73 g.
The Pioneer power system is currently only compatible with Dura-Ace 7900 or 9000 series cranks, fitting chainring combos of 50/34 and up. 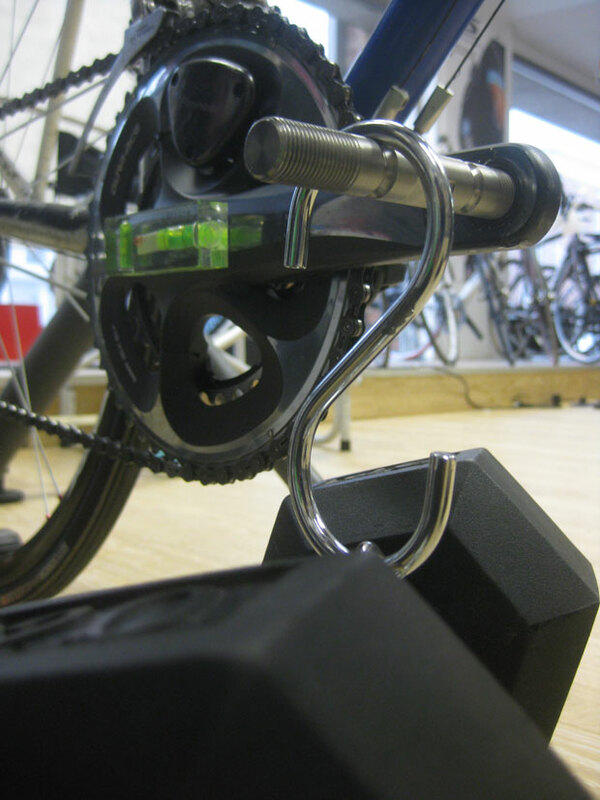 The system can be installed onto new cranks or retro-fitted. Plans to expand the range of compatible cranks, including Ultegra, are in the works. Where Pioneer’s background in data processing and transmission really pays dividends is the frequency and depth of their data transmission. While most power meters or computers can only transmit or receive at 1-4x per second, the Pioneer system processes both the tangential AND radial force and transmits it at every 30 degrees of a 360 degree circle. That’s 12 signals per crankarm for each pedal revolution. So simple math would state that, slugging away at 60 rpm, that’s at least 24 transmissions per second being processed and transmitted, far above any other system on the market. This isn’t just a “more is better” numbers game, instead it is necessary to enable what Pioneer really wants to deliver, and that is real-time feedback into pedalling dynamics and efficiency. 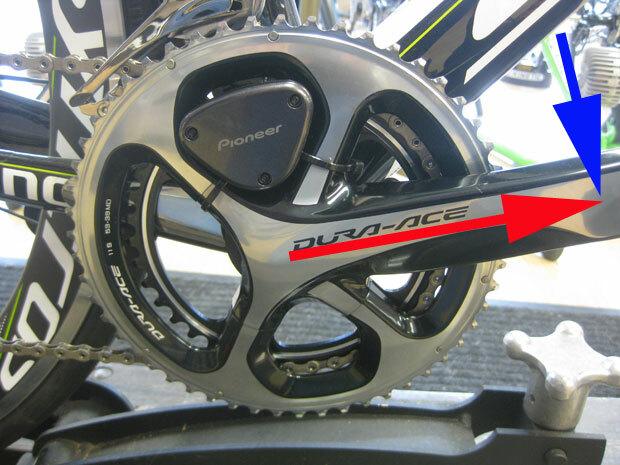 As with every other power meter, Pioneer relies on strain gauges to measure deflection forces. 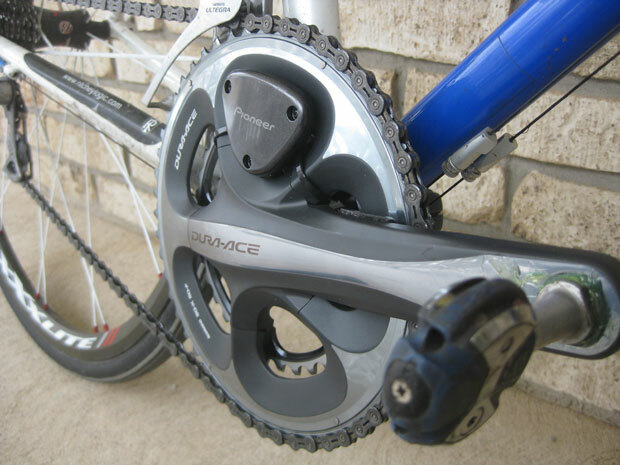 Beyond just total force on each crank though, Pioneer’s approach is then to measure two separate forces on each crank. One is the tangential force, which is what is actually turning the cranks, and runs perpendicular to the crank throughout the 360° of rotation. The second is the radial force, which is the force running parallel to the crank and directly down along the length of the cranks, outwards from the bottom bracket. Each set of strain gauges records both tangential (blue) and radial (red) force on the crank. From these two forces, Pioneer can then calculate the effective force. Ideally, 100% of the force to the cranks will be tangential force while 0% will be radial force throughout the entire pedal stroke. This is impossible to achieve in reality, but it would signal the perfect pedal stroke. The result of tangential and radial force gives you "effective" force, measured at 30° intervals throughout each pedal stroke and then transmitted to the cyclocomputer in real-time and stored for later analysis. •	The two circular graphs represent the force of the left and right legs. The beauty with the Pioneer system is not just the level of detail in the data, but that you get the information in real time on the cyclocomputer, serving as constant biofeedback to the brain and body. This feedback is critical for actually improving your pedal stroke. You get the complete force vector in real time on the CA900 computer screen too. Apart from seeing the force vector arrows on the display, the other really useful piece of data is your cycling efficiency. This is the proportion of the total force you put to the crank throughout the entire single pedal stroke that is tangential force (i.e., contributing to rotation). Again, you can see the efficiency for each leg, or a combined value for both legs. And for triathletes out there, there’s a simple swimming analogy. You know that you can go faster by pulling and kicking harder, or you can be more efficient in the way you pull and kick. The same idea holds here between power and efficiency. The magnetic rings on each bottom bracket cup provides not just cadence, but the exact point of the pedal stroke for each crank. What’s the point or relevance of your pedalling efficiency? The higher the percentage, the more force is being put towards actually turning the pedals, rather than wasted on radial force or negative force. Put another way, if both legs are generating 100 W, but your right leg is at 50% efficiency and your left at 70%, your left leg is actually doing a better job of turning the cranks than your right. The installation process is dead-simple for the consumer – you leave it in the hands of a professional dealer. Pioneer only sells through an authorized dealer, and there’s a reason for that. The installation process requires specially designed jigs, clamps, and epoxy, along with a detailed calibration process with specific equipment and weights. Like gluing on tubulars, the install process is straightforward but the entire process takes a couple of days from start to finish, due to the need for the epoxy to fully cure over several stages. 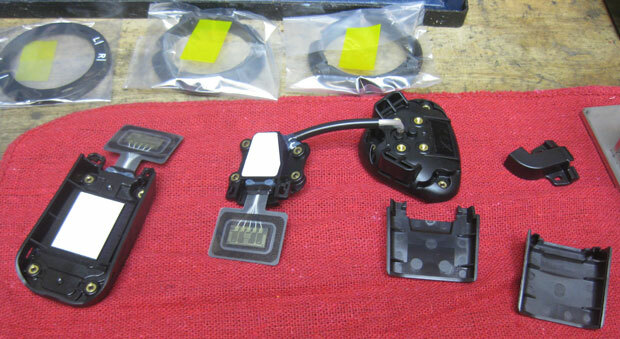 This includes first bonding and curing the strain gauges to the cranks, then the transmitter in two separate steps. Calibration is also performed by the Pioneer dealer, taking about an hour including setting up your bike to perfect level. These calibration values are then stored directly in the power meter itself, so the calibration remains correct regardless of which computer unit you use. Calibration of each set of strain gauges involves known weights being placed on each crank at both the 3 o’clock (tangential force) and the 6 o’clock (radial force) position, with a second calibration with no weight. Once calibrated, the main day-to-day need is to zero the calibration when there are wide temperature differences, such as has been the case this winter from taking the bike indoors to outside and -10°C weather. The zero-ing process is straightforward, and the power meter “learns” the calibration zero values at different temperatures over time, so there is theoretically less need to zero the power meter after a while. 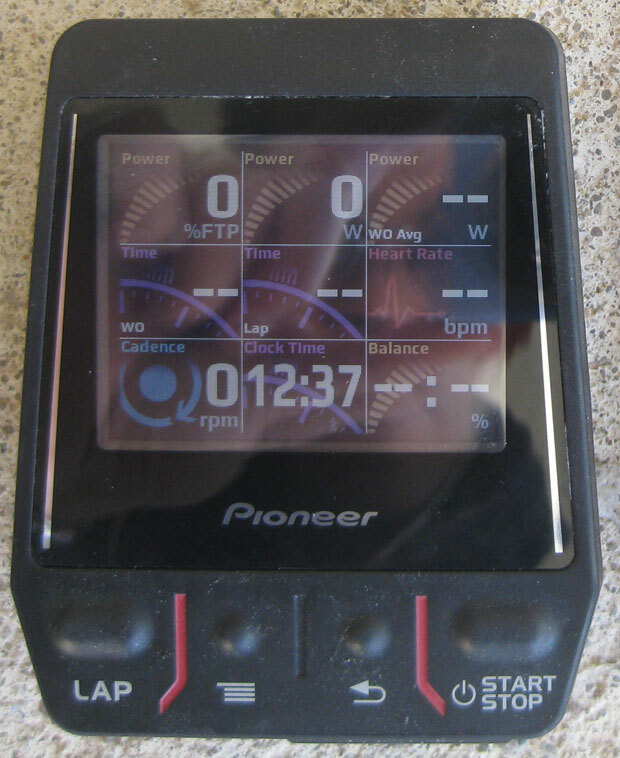 The Pioneer power meter and its SGX-CA900 cyclocomputer are sold separately. You can use other computers like Garmin, but you’ll lose out on a lot of the advantages of the total Pioneer system. Notably, while a Garmin will display the independent left/right power, it won’t be stored for downloading and analysis (total power will be stored), and other computers also will not receive, display, or record the force vector and efficiency data. Most of the interface is through the touch screen rather than the four buttons at the bottom. The computer itself has six windows of data, which you can scroll through by a left/right swipe. Each window can be customized with almost any metric you can think of (>100 possibilities), and each metric can also be made full-screen by a press. Changing between metrics can also be done by a swipe while in full-screen. Swiping moved between screens and a press gave a full-screen view of any metric, with a choice of white or black background depending on lighting and preference. I liked a few nice touches in the design. You have a choice of a black or white background. I found the black one more visible indoors and the white one better for outdoors. The brightness can be set from one to ten by swiping the main window up or down. The GPS picked up quickly and gave me the option to have auto-start/stop based on a threshold speed that I can set. 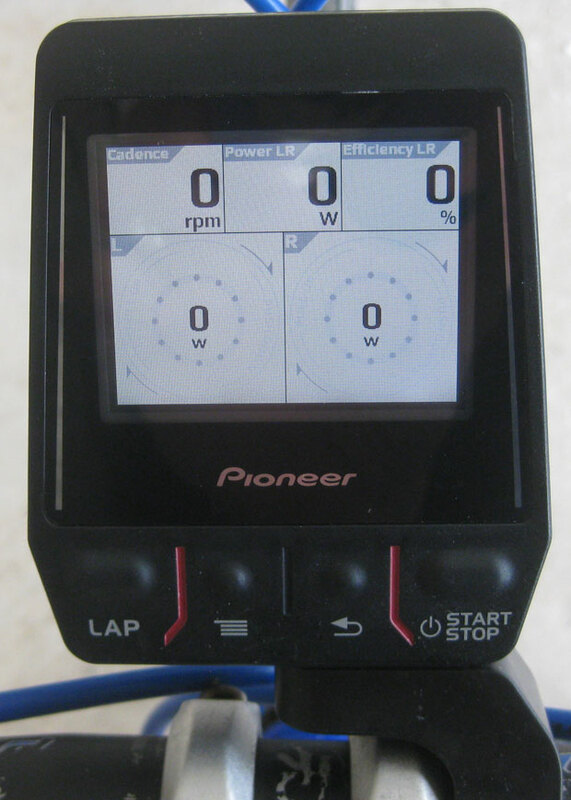 Once calibrated, the Pioneer power meter and computer system is really simple to use and has been completely reliable. To wake the power meter, just pedal backwards about 3 revolutions and the power reading should wake up on the SGX-CA900 computer. Beyond occasionally zero-ing the calibration, there really isn’t any maintenance notes to be concerned with. The batteries on both cranks’ transmitters are standard CR2032 watch batteries and are user-replaceable with a small screwdriver. 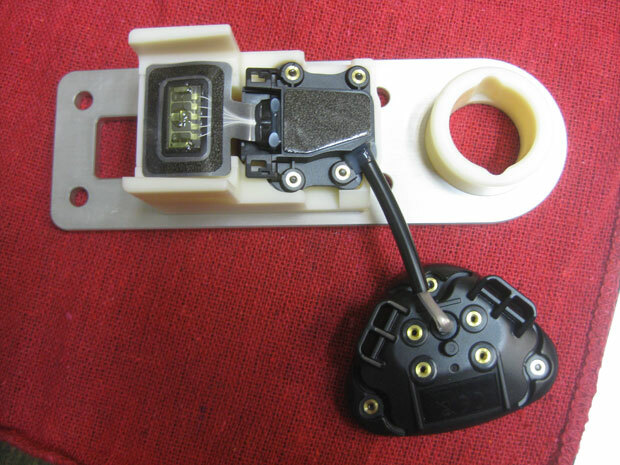 The left crank strain gauge is the part on the right of this pic. 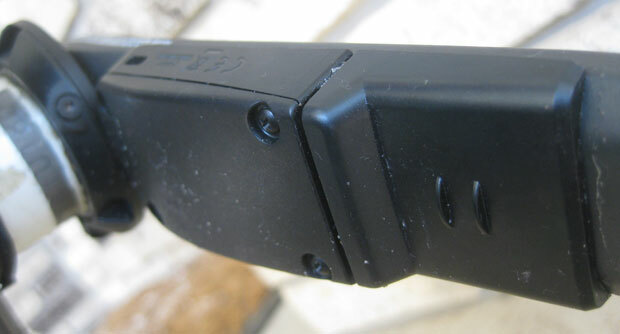 The left part closer to the BB holds the transmitter and user-replaceable battery. On the road, the Pioneer behaved and responded like you would expect from any power meter. It responded rapidly to any sudden shifts in power while standing, shifting, or sprinting. On the road, I really liked the 3s or 5s rolling average view of power and left-right balance on the Pioneer computer, which smoothed a lot of the sudden spikes and bursts you get with power data. Post-ride, the wealth of data is easily downloaded to Pioneer’s own free Cyclo-Sphere web-based software. The advantage of using Cyclo-Sphere is that you can see and analyze the full range of force vector, efficiency, and left/right power. This software is so detailed that it’s worth a separate review in itself. The Pioneer system is also compatible with most other existing data logging software such as Strava and TrainingPeaks, as Cyclo-Sphere can export its data in the .fit format. 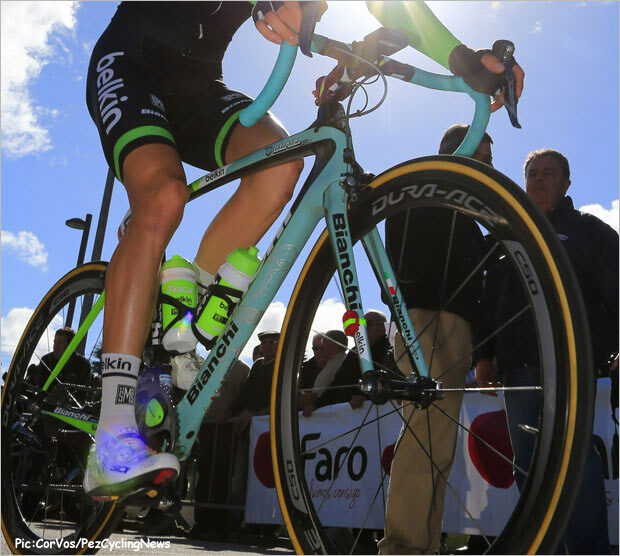 Team Belkin's Wilco Keldeman's Bianchi adorned by the Pioneer power meter in Andalucia. The thing that impressed me the most with the Pioneer power meter and computer is just how polished the entire system is in looks, feel, and human factors design. Some stuff that shows up on our doorsteps just have that hard-to-describe “prototype” look or feel to them, and it’s almost as if consumers are expected to be the beta-testers. Not the case with Pioneer, and very impressive for a brand new entry into the cycling market. We are in a golden age when it comes to the availability of technology to improve our cycling and our enjoyment out on the bike. If you’re in the market for a power meter, the big advantage Pioneer brings is the true left-right analysis. With a price that’s fairly comparable to its competitors, it’s a huge bonus if you’re wanting the most in-depth analysis of your cycling. Weight: 73 g for entire power meter (both sets of strain gauges and transmitters). Compatibility: 7900 and 9000 Dura-Ace cranks, 165 – 177.5 mm, 50/34 up to 53/39 chainrings; Ultegra 6800 coming soon. Wireless Coding: ANT+ (power meter and computer). Computer 126 g, 12 rechargeable Li-ion battery, bar mount, USB micro cable, touch-screen. MSRP: $1600 for power meter; $900 for computer. More info on the Pioneer Power Meters at pioneer-cyclesports.com and you can get your hands on them in Canada through Racer Sportif and La Biclicletta Toronto. PezCycling News and the author ask that you contact the manufacturers before using any products we test here. Only the manufacturer can provide accurate and complete information on proper use and or installation of products as well as any conditional information or product limits that may limit their use.